Mumbai : Bollywood Megastar Amitabh Bachchan and the first 'He-man' of B-town, veteran actor Dharmendra, recreated the magic of their on-screen friendship 40 years later in the final episode of TV show “Aaj Ki Raat Hai Zindagi”. Both of the actor enthralled viewers through their roles of 'Jai and Viru' in the 1975 blockbuster “Sholay”. 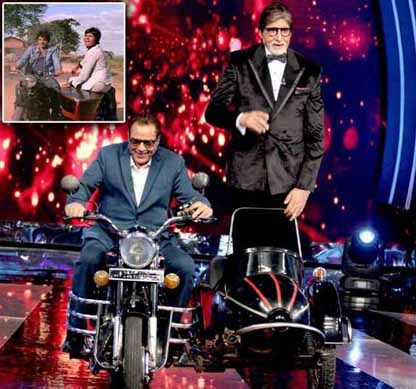 The duo, who wowed fans with their impeccable bond in the Ramesh Sippy classic, recreated the euphoria of the memorable song “Yeh dosti hum nahi todenge”, in which they were seen riding a bike with a sidecar. Amitabh took to Facebook on Saturday to share photographs of the Star Plus show's finale, in which Dharmendra can be seen riding a bike while "Jai" is standing in the sidecar. “When Viru and Jai met on 'Aaj Ki Raat Hai Zindagi', then 'Ye dosti hum nahin todenge' happened. The song is so prevailing even after 40 years. Very less we get to see this. Those were the days,” Amitabh wrote alongside the photograph. Considered as one of the biggest classics of Indian Cinema, “Sholay”, which released on 15 August of 1975, also starred Sanjeev Kumar, Amjad Khan, Dream-girl Hema Malini and Jaya Bachchan. The story of Ramgarh village which called by name of 'Sholay', Directed by Ramesh Sippy starring by Sanjeev Kumar as Thakur Baldev Singh, Amjad Khan as Gabbar Singh, bollywood's megastar Amitabh Bachchan as Jai and Dharmendra as Veeru Initial release in India on August 15 of 1975.